A simplistic design emphasizing its minimal yet stunning details, the Hover pendant is speaks volumes and is a welcome addition to Platinum by Quoizel. 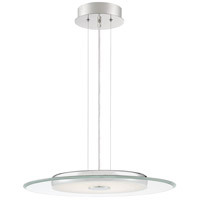 The flat disc of clear glass features glittering crystal sand in the center to obscure the integrated LED. The effect creates a shimmering vista of light.